Halo 2 may be getting the Halo: Combat Evolved Anniversary treatment if reports are to be believed. 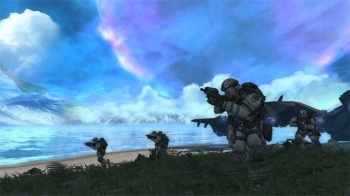 343 Industries, the developer charged with the Halo franchise following Bungie's decision to fly the Microsoft coop, has started development on a follow up to last year's Halo: Combat Evolved Anniversary. Xbox Magazine didn't cite any sources or give any details about the project, and Microsoft responded to questions about the title in its traditional manner. "Our focus right now is on developing Halo 4. Beyond that, we do not comment on rumors or speculation," a Microsoft spokesman told Kotaku. Personally, I'd be more surprised to learn 343 weren't working on a follow up to Anniversary. Slightly-upgraded ports of last-generation titles have become a relatively quick and easy money spinner for most developers. While Sony has been pushing HD ports of PS2 titles hard, the Xbox's library has been left mostly untouched.